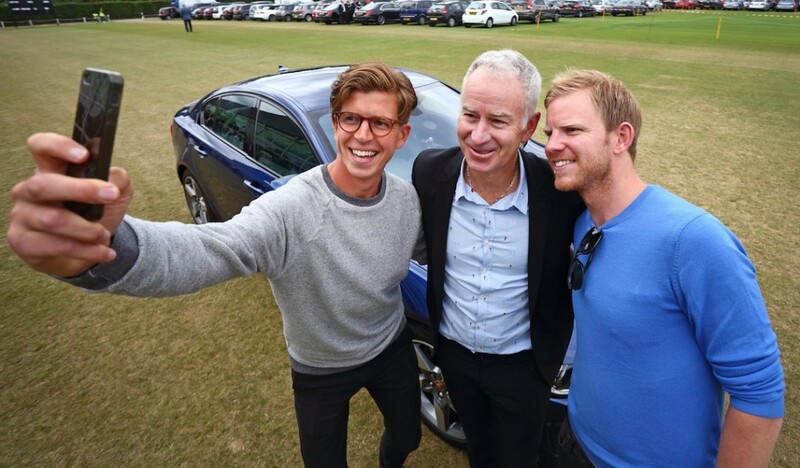 by Jim Corbran, Automotive Columnist Imagine being these two tennis fans, and finding out that John McEnroe was behind the wheel of the Jaguar XE in which you were being whisked to the All England Lawn Tennis Club for the championships at Wimbledon a couple of weeks ago. It was all part of a contest by Jaguar, for the winners to be chauffeur-driven to the event, which in itself would be a pretty neat prize. The two winners, Tom Payne and Nick Webb, were wearing biometric wristbands supplied by Jaguar in order to “…analyse and celebrate the unique spectrum of emotions associated with the world's number one tennis tournament.” Selected fans every day in the stands were given the bands to measure their heart rates during the tennis matches. The bands worn by Payne and Webb also measured their reaction when they realized McEnroe was behind the wheel of their Jaguar. Payne’s heart rate increased by 60.3%. Yikes! Luckily, McEnroe is no longer the bad boy he was during his early tournament playing days. Back then he might have given the two lads heart attacks. You can view a YouTube video of McEnroe the Chauffeur here: https://youtu.be/xbXez5GTujo ### The post JAGUAR CONTEST WINNERS SURPRISED BY THEIR CHAUFFEUR appeared first on Buffalo Cars.